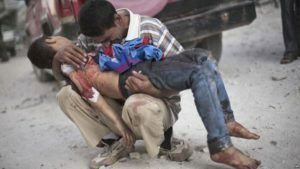 More than 300,000 people, including over 86,000 civilians, have been killed since the Syrian conflict began in March 2011. In total, 301,781 people have been killed, according to numbers provided by the Syrian Observatory for Human Rights and quoted by AFP on Sept. 13, the first full day of an internationally-brokered truce. The civilian toll includes 15,099 children and 10,018 women, the Britain-based monitoring group said. A total of 59,006 Syrian soldiers have been killed, in addition to 48,048 other pro-government fighters from countries including Iraq, Iran and Lebanon as well as Syria. Rebel factions have lost 52,359 fighters in battle. Jihadists of Islamic State of Iraq and Levant (ISIL) and former Al Qaida affiliate now renamed the Fateh al-Sham Front accounted for 52,031 of the dead, the Observatory said, adding that another 3,645 victims could not be identified. Under a deal brokered by the United States and Russia on Sept. 12, “fighting will halt across areas not held by jihadists and aid deliveries to besieged areas will begin, with government and rebel forces ensuring unimpeded humanitarian access to Aleppo in particular,” the AFP report said.